Data science, big data, machine learning and deep learning - Buzzwords or true reality? Are scientists really able to predict what you have underneath your bedside table? Nowadays, it is popular to claim that with enough personal data, scientists are able to understand and reveal every detail about your personality using modern machine learning techniques. Predominantly, it depends on the quantity and quality of personal information available about you. Quantity of course matters, but what about the quality of the information? This is where the real challenge lies. Quality is simply the connection between information and prediction: the tighter the connection, the more accurate the prediction will be. That’s a simplistic definition of data science: it exploits many bits of information (or features), to create a reliable prediction. Every bit of information can be directly connected to the prediction outcome, or used to simply support the outcome. Your social network posts. Did you lose anything recently? Perhaps you vented about it online? Have you recently bought something that can fit underneath your bedside table? Your interests and affinities (courtesy of the Intent HQ Topic Graph). What is your favorite sport? And your favourite kind of music? Do you like jewellery? Now, how do we aggregate this data and create a model? Well, that’s the data science secret sauce! It’s not an easy answer, and furthermore the solution is not unique (a combination of stats and math; a mixed blessing). I recently spent some time writing a book all about data science, outlining the essential parts of this complex subject. 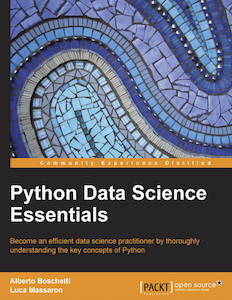 It’s very practical, so the reader will have a complete hands-on experience of the essence of data science.